In my garden. March 2009. Very lovely TT.....really like the freckles there! This miniature iris surprised me with its lovely colours and structure. very pretty ~lovely colour and fantastic angle! Very lovely yellow .... i like yellow, and i see some cutie stones too! This mini iris is one I would recommend. Yes, lot of little stones. This is a log-shaped terracotta planter. Lol. 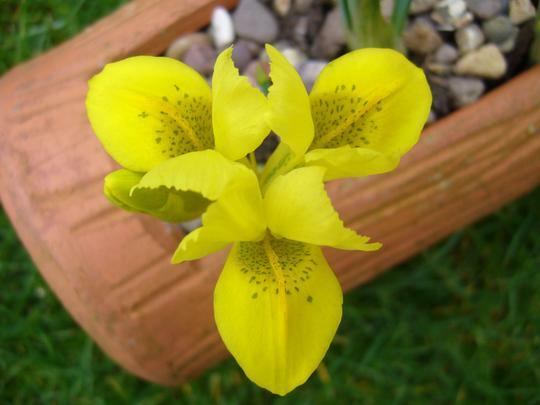 Do you have miniature iris ? Some of the terracotta pots crack in the cold weather. Speaking of snow leopards...and you were on another picture...This flower has pretty leopard spots! So springy! I recently found this on your photos Janette. Yours are lovely, photographed from a different angle. Lol. My farourite have this one TT and a real delight it is to. Nice to see you on GoY again. This is a cute little iris. It surprised me by turning out even prettier than the picture on the packet. Lol. i lost all mine:o( pots cracked in the frost and then i think the squirrels found them. hopefully get some more soon. Yesterday a blackbird dug up a pot of my summer bulbs I'd only just planted, so that he could get the wet compost to make his nest. He made SUCH a mess ! We miss you too, Catfinch, but we know you're busy with other things. Truffle definitely is TROUBLE today. He's been working out how many naughty things he can pack into one day. Lol. That's lovely TT. I really like the spring bulbs. This is such a sunny colour. I must look for them for next year. keep an eye on 'casualty corner' in the gc. our local one reduces those things that have gone over. I am going there this weekend. i got my iris 'harmony' from such a place. 10 pots for £2 and look at how they grew from planting in the green. Yes that's why I like to grow mineature daffs and crocuses. I have to put the tall ones in some shelter. I like that iris and the container too. Oh, Spritz, that's a pity because these are such cute flowers. I end up putting big pebbles and stones on the surface of anything in a container, but even that precaution doesn't always keep the birds away ! Any ideas please ??? ... and glad you like this little iris. What a lovely word ~ sunshiny ! Hi TT, was looking at this photo, and I realied I liked it in March and I like it now! I must say, my dwarf Iris bulbs I planted last fall grew into some very spindly looking Iris. Nothing like this. My larger ones from last year, haven't bloomed yet, but the leaves are nice and tall, and already they look like they will grow big and strong. I think the dwarf bulbs would've done better in a pot, or possibly if we didn't have so much rain this spring. But again, this is just a lovely flower, and a great photo! Yes, a lot of bulbs seem to do better in pots, don't they. Last year my hyacinths did very well in pots. This year I planted them in the ground, and they were not so successful. I might put them back in pots for next year ! Lol.